Completed in 2017, each year the 500kw solar power system reduces CO2 emissions equivalent to over 520,000 lbs of coal, 70 homes or CO2 removal by 560 acres of forest. Just wanted to let you know how happy I am with the bucket. I have over 20K hours in a skid steer, and this bucket is the best I have used. My guys like it as well. They want me to trade out our OEM buckets and get more Virnig buckets. I am considering it. Having the right equipment makes brush clearing easier. 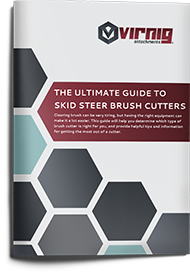 This guide provides helpful tips to determine which brush mower is right for you and how to get the most out of your skid steer brush cutter when you do purchase. High yield strength plate steel, more welds and better reinforcement. The highest level of precision with every cut, on every steel part, every time. Robots ensure consistent weld quality and increase output for shorter lead time. Superior resistance against corrosion, abrasion, and fading. USA made motors and major hydraulic components for unmatched performance and longevity. Immediate access to over 40,000 stock parts ready for same-day shipping. Virnig sells skid steer attachments through a network of independently owned dealers. Call 800-648-2408 for assistance in finding a dealer or use the Virnig Dealer Finder. Please contact a local Virnig dealer to obtain pricing information. For Virnig’s suggested retail price, please fill out an online Request a Quote form. What Type of Attachment Interface or Hookup Does Virnig Use? All Virnig skid steer attachments are manufactured with a universal mount to fit most skid steer loaders. The mounting frame is built to ISO 24410 and SAE J2513 standards.